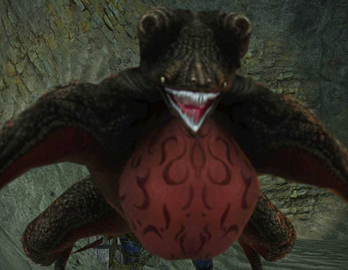 Basilisk is an enemy in Dark Souls 2. Frog-like creatures that cast the petrify effect on players by using a fog-breath attack, otherwise offer very little danger. A giant, and much more formidable, version will attack the player more directly. Unlike in Dark Souls, these enemies can inflict physical damage with a leaping attack. In Shaded Woods and Aldia's Keep, default Basilisk can be found in caves and trapped inside carriages. In Brightstone Cove Tseldora there is a subspecies of Basilisk (a.k.a. Sand Basilisk) whose bulbous false eyes have completely atrophied as an adaptation to living in desert environments. This variant still attacks with petrifying breath but has also learned to burrow under the sand, enabling it to ambush its prey and travel undetected. In Shaded Woods and Aldia's Keep, there is a subspecies of Basilisk (a.k.a. Great Basilisk) whose the size is five times larger than normal basilisk and green skin tone whick makes them look like an enlarged treefrog, the range of the mist is much wider, and the melee attack can even break the cages. Wear Ring of Life Protection to eliminate the need of Fragrant Branch of Yore even after being petrified. This should be updated to include the basilisks in Things Betwixt behind the petrified statue. "hue hue hue, let me whisper in yo ear"
There&apos;s also one in Heide Tower. Anyone know the chances of stones being dropped? Ive been farming for a darknight stone FOREVER, gotten every single other stone and i want to know what the odds for a drop are.